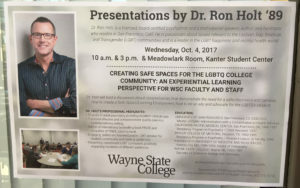 Creating Safe Spaces for the LGBTQ College Community: An Experiential Learning Perspective for WSC Faculty and Staff. This presentation was part of a diversity lecture series sponsored by PRIDE and the Assistant Dean and VP of Student Services. The presentation consisted of reviewing LGBT student case scenarios through small breakout groups, which allowed an experiential learning perspective. After discussing a particular case as a smaller group, the group would present the case to the whole audience with Dr. Holt as the facilitator. The audience consisted of faculty and staff of the College. Excellent discussion and openness. Ask for the preferences on pronouns. I will be more obviously open. I didn’t know all of the definitions. Will be open to all students in our area and around campus. Essential to keep trying – even when you make mistakes – apologize and try again. I have a little more insight into a couple of students I know who are transitioning.